Established in 2003 the Advance Ashburton Community Foundation has grown from nothing to now manage over $10 million for the benefit of everyone living in Mid Canterbury. At a meeting, sponsored by Ashburton Enterprise Agency, on March 13th 2003 at the Hotel Ashburton, speaker Peter Wyatt of the Compass Foundation in Tauranga, described how Foundations operated and how they could benefit the community. Attending that meeting was Neil Sinclair, a founding partner of the accounting and share broking firm in Ashburton, Gabites, Sinclair and Partners. Neil believed “Ashburton has many people living here that would like to give something back to the community” and from that moment worked tirelessly to establish and grow this Foundation. The aim was to create a perpetual charitable trust that would accept donations to invest, and distribute the income to worthy community organisations and causes in our district. The community charitable foundation movement was supported by the Tindall Foundation which was overwhelmed with applications for funds and saw the need for community foundations to more appropriately respond to local needs. Neil Sinclair, businessman Russell Anstiss and solicitor Laurence Cooney attended the first meeting of the “Ashburton Charitable Foundation” on May 5th, 2003 at the offices of Nicoll Cooney and Co, Tancred St, Ashburton. On June 4th, 2003, the “Ashburton District Community Charitable Foundation” was established by Trust Deed signed by the founding trustees: Neil Sinclair, Laurence Cooney, Ronald ‘Murray’ Anderson, William ‘Russell’ Anstiss, Elizabeth Ashford and John ‘Bruce’ Bell. The Certificate of Incorporation was dated June 11th, 2003. And the charitable tax status received June 26th, 2003. The first donation was made by mayor Murray Anderson of $100. To avoid confusion the name was changed to Advance Ashburton Community Foundation early in 2005. Once the framework of the Foundation was established, it was publicly launched on September 16th, 2005 at the Hotel Ashburton with Stephen Tindall and Trevor Gray from the Tindall Foundation addressing the audience. The Foundation became the Funding Manager for the Tindall Foundation in 2006 which allowed AACF to make donations to support families and social services with Tindall funds while the Foundation was still in its infancy. The first paid staff member was Margaret Rickard who was appointed to a 15-20 hour a week Executive Officer role in March 2010. Her role was to promote the Foundation, obtain donations and bequests and work with donors. The first $1m in managed funds was reached in 2011. 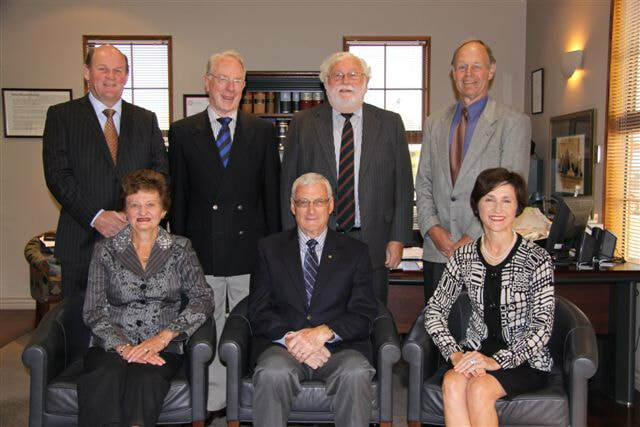 The 2010 Trustees of Advance Ashburton. From left, sitting, Anne Fleming, Neil Sinclair (Chairman), Elizabeth Ashford. Standing, Bede O’Malley, Kevin Geddes, Laurence Cooney (Deputy Chairman) and Graham Robertson. From these beginnings, Advance Ashburton Community Foundation has grown to be a significant force for good in our community. In February 2016 Neil Sinclair passed away. Neil Sinclair had been Chairman until 2013 and only retired from the Board in December 2015. He had been honoured in 2015 with a Queen’s Service Medal for his services to the community. Neil and his wife Jeanette had established a Fund with the Foundation which is at present supporting a major child literacy project in Ashburton primary schools. Just before his death and with $10m in funds, Neil said: “Today I’m really proud of how the Foundation has grown. I look back on my life and realise that the things you do for your community are some of the most satisfying things in your life”. Neil’s legacy will benefit our community now and forever.